– If you’re looking for ways to help your kids learn and memorize their Bible, this FREE printable Bible Verse of the Week worksheet is a simple and easy way to get started. One sheet per week, is all you need. And perfect for all ages. – Whether you love to take day trips or longer family trips, there is always something to be learned along the way. Before you take off on the open road next time, check out these FREE travel printables for homeschool families! – Are you a Charlotte Mason homeschooler? Maybe you need a little pick-me-up during the week or just a constant reminder of why you do what you do? These FREE printable quote can be printed or used as a phone background. – If you’re looking to add more handicrafts and and projects to your homeschool day, look no further. This beautiful collection of Charlotte Mason Inspired crafts will not only give your kids something to do besides staring at a screen, but they will give you time to connect with them one-on-one too! Get yours FREE thru 4/19/19 only! – Are you learning about birds of paradise? Or maybe you want a fun way to work on logic and math skills? Try these FREE printable Birds of Paradise Sudoku puzzles for your kids! – Do you have a garden? Would you like to grow your own herbs? Now your kids can learn all about Rosemary with this themed nature study and try a few recipes using rosemary too! – Kids get so excited when they see their own seeds sprouting and growing! Spring is the perfect time to get started with a gardening project and what better way to teach them about seed germination than by doing it yourself. And these free printables will help to expand the learning as you go. – If you’re a Charlotte Mason/Classical homeschooler, you will love these FREE printable sampler nature pages from the brand new Gentle + Classical Nature study. In these 50+ pages, you’ll learn about bees, dragonflies, life cycle worksheets, French & Spanish flashcards and much, much more! – The layers of the Earth hold so much history and science waiting to be told. Learn all about the different layers and what you can find in them with these FREE printables. – Spring is the perfect time to learn about different types of birds. In this mini puzzle pack, kids will learn about 12 different types of birds through fun puzzles, matching, sudoku and more. Plus a glossary page with a description of each bird! – Rocks and fossils can tell us so much about the earth and their environment. Learn all about them with these FREE printables and resources! – This adorable caterpillar number match game is a fun way to introduce and/or review numbers with your little ones this spring. This game will help them see numbers in several different ways, which will improve fluency. – Do your kids struggle with rhyming words? Here 4 fun and easy ways you can work on rhyming words with your young learners. Don’t forget to download the FREE Rhyming Worksheet to use with your kids! It’s available for both readers and non-readers. – It’s spring time, which means your kids will be seeing and probably hearing more animals outside. This owl printable pack for preschoolers includes letter and number copywork, line tracing, puzzles, games, matching and much more your little ones love! – Learning and mastering the short and long vowel can be difficult for some kids. Make the practice more fun with these FREE sorting mats. – Do you have a little gamer in your house? They are sure to have fun working through this themed prek printable pack. They will work on handwriting, prewriting fine motor skills, alphabet mazes, matching, puzzles and more! – Your little Star Wars fans will be so excited to join in the May 4th celebrations this year with this activity-filled pack just for them! Includes 29 pages of puzzles & activities! – If your kids love using creative writing prompts to get them started, this set has everything you need. Lined and decorated pages for younger kids and task cards for older ones, you’ll find just what you need to help get those creative juices flowing! – Are you worried about reading comprehension? Do your kids struggle to remember parts of stories or books they’ve read? Now you can improve and track their reading comprehension using these FREE progress monitoring forms. – Vocabulary is one of those subjects we often gloss over with our children. But giving them a solid foundation in vocabulary is important. Check out these reasons why it is important and how it can benefit your child. Plus download the FREE Vocabulary Resource Pack to get you started! – The Hungry Caterpillar is a wonderfully fun and creative book that little kids love. Use these FREE printable 3-part cards to enhance their learning as you read through the book. – Do your kids have a hard time getting started on a book report? Do they need a little inspiration to get going? These FREE printable book report forms and templates is a great place to start! – These fun Star Adventurers Notebooking Pages are PERFECT for all your Star Wars loving enthusiasts. They are a great way for them to share what they know about their favorite characters, stories and MORE! – Many kids struggle with learning place value. Make it a little more fun with this FRE printable rainbow themed place value activity. – Learning to count is a vital math skill for little ones. This adorable Counting Ducks printable pack is perfect for spring days and learning to count up to 10. – Do you have a horse lover in your family? This FREE breeds of horses guided drawing activity covers 10 different breeds where they will learn about what makes each breed unique in a short paragraph, a guided drawing activity and a short review with answer key to complete the unit. – Spring is here and with it comes new life through the flowers, birds and plants that grow once again. This FREE Spring printable pack includes over 70 pages of alphabet matching cards, writing pages, coloring pages, vocabulary cards, fun mazes, puzzles and much more! – Notebooking is a great way to record what you learn on a particular subject. This pack includes 33 musical terms and 47 musical instruments to introduce your kids to the world of music. But get it quick, this is only FREE for a Limited Time. – Do your kids know about the Titanic? The ship itself was captivating, but the story is tragic. They will learn all about the ship, its passengers and the events that took place that fateful night in this FREE printable pack. – If you’re studying the continent of Europe, your kids will love working through this FREE notebooking journal. This is also a great way to do an overview of the countries. – Do your kids have an entrepreneurial mind? Would like to make some extra money, but not sure how? Check out this FREE brainstorming printable to help get them started. – If your kids think history is boring, think again! This brand new Early American History curriculum brings history to life like never before. And it’s all FREE! This history curriculum can be used with all ages. 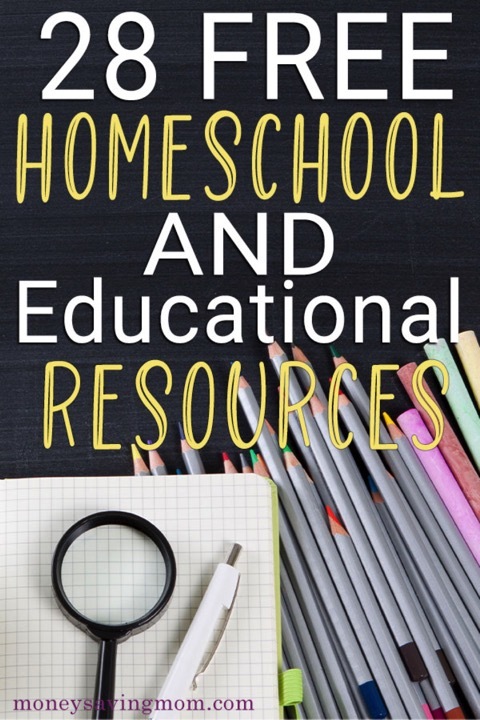 Carrie has been homeschooling for over a decade and loves to share FREE homeschooling resources, deals, and reviews over at . 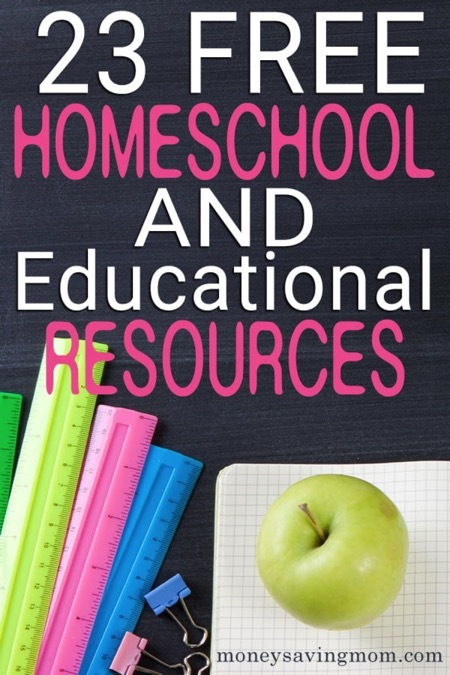 You can find homeschool freebies, free homemaking resources, meal plans, free unit studies, and much more. – Teaching your children not only about the true meaning of Easter, but what happened to Jesus after is easy with this FREE printable pack. – Get your little ones outside and learning about all things living with this FREE printable April Activity Calendar for kids. – Do your kids know the history of the Cinco de Mayo holiday? What do they think of when you say it? Now they can learn about the history of the day, historical figures and more with this fun coloring book. But hurry…it’s only FREE for a limited time! 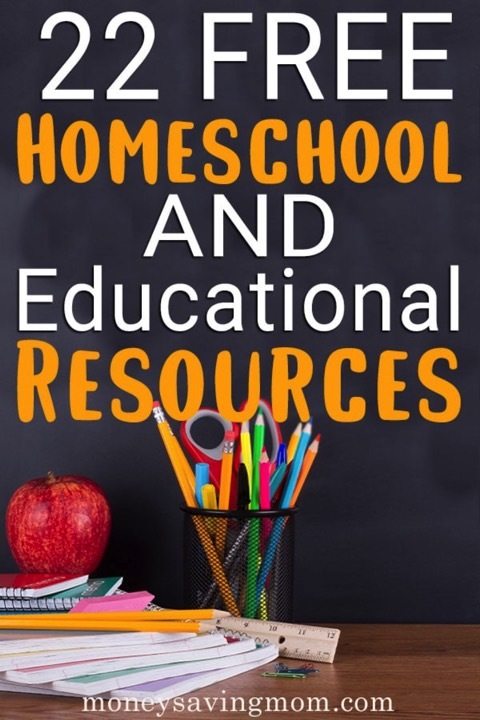 – Whether you’re a classical homeschooler or not, you probably know the struggle of finding just the right curriculum. This free printable will give you step-by-step instructions on choosing the best curriculum for your family. – Do your kids love doing crafts and creating things? Print off this FREE Activity and Craft Guide for the month of April to help give you some fun ideas. – Did you know almost every day of the year is a holiday? Some are silly and some are fun. Even some are educational. These monthly calendars will give you fun and interesting topics to study! – Do your kids know the entire story of Easter? Can they tell what happened in order? These FREE printable writing cards include a word bank to help kids not only tell the story in order, but with accuracy. – Are you studying butterflies this year? Do you have a lot of butterflies in your backyard? Here are four things you should do during your next study. And don’t forget the printable pack! – Are you studying different types of birds in your homeschool this year? Download these FREE types of birds writing activities. This set includes both copywork, writing prompts and draw-then-write pages. – If your kids love to collect rocks, why not study them! This FREE vocabluary copywork notebook will introduce your kids to rock terminology in a fun and interactive way. – Thunderstorms can be fascinating when they’re not scary! Teach your kids all about thunderstorms and the science behind them with these printables and unit studies. – Do your kids know the steps to plant a garden? Now they can learn the correct order of planting a garden and work on their sequencing with these FREE 3-part cards. – If you’re studying the Earth, you don’t want to miss this FREE printable notebooking journal. It covers 26 different layers or spheres of our amazing planet. – Volcanoes are fascinating natural disasters. Kids can learn all about them, vocabulary, historical volcanoes and more with these printables. And you don’t want to miss the FREE Instant Download! – Do your kids love “I Spy” activities? These adorable and fun spring I Spy pages are great for a rainy day or just for some added fun to your spring studies. – Introduce your little ones to butterflies in a fun and unique way with these simple puzzles! This pack includes 18 different puzzles (9 two-piece and 9 four-piece puzzles). Simply download, print, cut and go! – Little ones can work on their fine motor skills while they learn more about the Resurrection with these FREE printable Resurrection Day playdough mats! The set includes 4 different letter pages and numbers 1-10. – Spring is a fun time to be outside and enjoying nature. So why not bring a little bit of that fun to your studies too! This printable spring workbook includes math and counting activities for your little learners! – Little ones will love learning all about Earth Day through puzzles, prewriting exercises, beginning sounds and much more! – If you have a preschooler or kindergartner, you don’t want to miss this LIMITED TIME Early Learning Bundle. With 20 FREE resources to choose from, you will find everything you need here! But hurry…this offer ends Friday, April 12th. – Have you ever done a write the room (WTR) activity with your kids? It is a fun, movement-based activity that allows kids to work on their words using papers place around the room. This one deals with short ‘e’ words. – Your new and early readers can learn more about Earth Day with these FREE prinrable emergent readers. There are four different types of readers from beginner (single words) to more advanced (fill-in-the-blanks). They are available in both color and black & white. – Do you have Star Wars fans in your house? They will love working through these Star Adventurers writing activities! They can practice their handwriting with copywork (manuscript or cursive) as well as improve their imaginations with the writing prompts! – Do your kids struggle with their spelling words? These FREE printables, tips and tricks can help them not only improve, but master spelling with some fun along the way. – These fine art pages are a fun and easy way to add some art appreciation to your homeschool. During the month of April you can download this FREE collection! – Spring is the perfect time to study all about the weather. Make it even more fun with these FREE printable weather themed puzzles. You’ll find crosswords, word searches, sudoku and more! – Are you looking for ways to help your kids remember what you’ve read during Bible time? What about just learning more about the Bible in general? Download, print and play this FREE Printable Bingo Game to make it fun and help it stick. – If you are looking for a nice Bible study to do for Resurrection Sunday, don’t miss this LIMITED TIME FREEBIE available through Friday, April 5th. Now is the perfect time to start this study! – Earth Day is this month and these FREE notebooking pages are a fun way to add some learning to your celebrations. There are a total of 87 pages in this set that can be used with early writers thru middle school. – Whether you’re a die-hard fan of Star Wars or just know a little bit, your kids are sure to love working through this fun and FREE Star Adventurers puzzle pack. – Are you slowing down in your homeschool? Are you struggling to stay focused and finish the year strong? This planner has all the help and printables you need to get focused and stay strong to the end. – Are you studying about space and the solar system this year? Your kids will love this printable Bingo Game. It includes 2 different levels, calling cards and 12 different boards. – Sheep are amazing and fascinating creatures. Now your kids can learn all about them through these printables and activities. There is even a FREE Instant Download with facts and labeling! – Do your kids ask all kinds of questions anytime there is a thunderstorm? Why is it so loud? What makes it thunder? They will learn the answers to these questions and more in this FREE copywork notebook. – Whether you’re learning abour volcanoes or they fit in to your history studies, this FREE Notebooking Research Journal would be the perfect addition to your studies. – Do your little ones need a little more practice on their letters and sounds? Download these FREE printable worksheets to help them practice a letter each day. – Most kids can sing the alphabet song long before they can recognize the letters or even sounds. Help them learn both and have some fun with these FREE printable action cards. – Do your little ones love flowers? Now they can continue working on their identification with this fun color matching activity. – Whether you’re studying spring weather, animals, bugs or just enjoying the season, your little ones will love working through this Spring Themed Unit. But you better hurry…it’s only FREE for a limited time! – Are your kids learning about the weather this year? They will love this fun and adorable Weather Tot & PreK-K Pack filled with puzzles and activities for beginning sounds, prewriting, matching, and much more! – People call it different things, silent e or sneaky e, but nevertheless it is a hard one to grasp for new readers. Give them a little help and a fun review with these FREE clip cards with magic “e”. – Has your little one been working on sight words this year? Check their progress with this FREE printable assessment of sight words. – Do you have a horse fan in your house? They will love working through this FREE horse themed pack. Available in two levels, you can choose from early learners or elementary ages. – You don’t have to be an expert at poetry to love it or teach it. This FREE printable download will teach them about 5 different types of poems and help them create their own. – Do your kids have trouble with integers? Not sure they will ever use them in the real world? Download this FREE printable with real life lessons. – If your kids are learning to count money or struggling with it, these FREE printable hands-on activities can only help. Sometimes just seeing the money isn’t enough, but doing things with it helps to connect the dots. – Does your high schooler need some accountability with their assignments? Try using the online tool, Trello. Download the free cheatsheet to help you set it up and get started! – Resurrection Sunday is just around the corner and this unit study is a great way to teach little kids about the true reason we celebrate. This printable pack includes 29 pages of history, language arts, math, science, geography, drama, and more. Get it FREE thru Monday, April 15th. 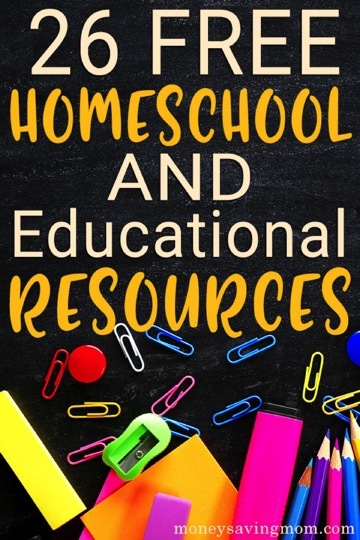 Carrie has been homeschooling for over a decade and loves to share FREE homeschooling resources, deals, and reviews over at . 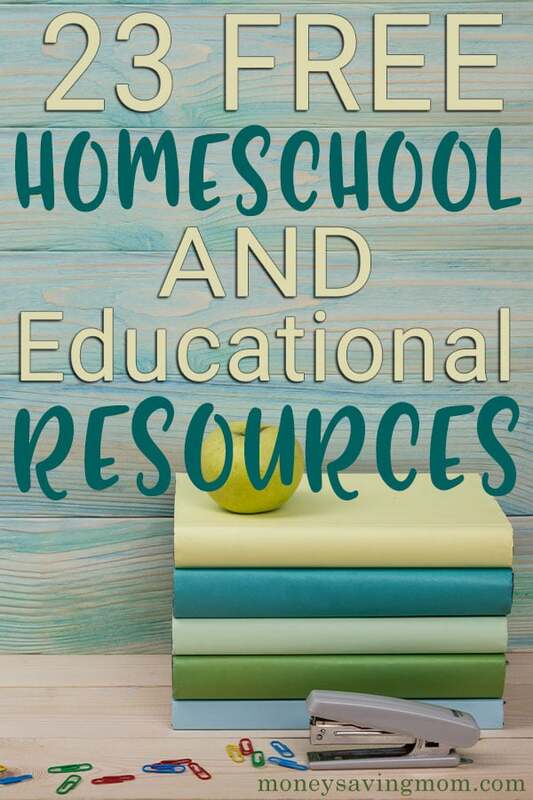 You can find homeschool freebies, free homeschool curriculum, free homemaking resources, meal plans, free unit studies, and much more. – “It’s not about the bunny; it’s about the lamb!” FREE Easter Printable that puts the focus of Easter where it belongs! – Whether you’re a beginner or a veteran homeschooler, you’ve probably asked yourself this same question. Use this page to help you remind yourself “why” you homeschool on those hard days. – It’s hard enough for adults to remember we are fearfully and wonderfully made. This FREE printable lapbook will help teach and remind our kids they were made by the Creator of the universe. – Help your kids learn about tropisms and methods of seed dispersal with this FREE Ways Plants Move Guided Drawing activity. – This first (of 3) nature study science curriculums covers Inland Waterways and Forests. Designed for K-2nd grade, this curriculum follows the key philosophies of the Charlotte Mason and Classical methods with a touch of unit study. Download yours FREE today. – Do your kids like to research and learn about different animals? Download and use these FREE printables for all their animal research. – Spring is the perfect time to go camping with your family and friends. Whether you take this FREE pack along with you or have students complete it ahead of time, it is a fun way to start the camping season. – Gardening is a great way to teach kids about science and the earth. Use these FREE printable 3-part cards to introduce them to different gardening tools. Then they can learn how each of them works! – This plant terminology copywork notebook looks at the definitions of plant terminology words, such as photosynthesis, vascular and nonvascular, and many other words. A definition is given for each term, along with space for copying the term. – Whether you’re studying the geography of each state or want an overview to get started, check out this post with everything you need to learn all about the 50 United States. – Did you know there is more than one category of ‘wonders’ in the world? Learn all about the seven natural wonders with this FREE reading comprehension geography unit. – Whether you’re just starting to work on the alphabet with your little ones, want a fun way to review the letters or need a little reminder to help them through their work, this FREE printable alphabet chart is the perfect solution. – Learning to count is more fun when you make it a game. Download and print out this FREE Butterfly themed counting jar mat to give little ones some extra practice this spring. – Little ones will love working through this adorable Earth Day “I Spy” Fun Pack. It includes an I Spy page with counting practice, graphing page, matching and more. Download yours FREE today. – Little kids love to go outside and watch for birds. Give them some fun and educational activities to complete this spring. This pack includes beginning sounds, wall word cards, read-trace-build-write pages, clip cards, and more. – Do you live in an area where there are lots of birds? Have your kids learn 12 different types of birds with these FREE coloring pages and emergent readers. – Teaching silent ‘e’ can be tricky. Many kids have trouble remembering all the words and tricks. Check out these FREE printables to help you teach it to your little ones. – Learning and mastering long vowels and dipthongs is important to reading skills. Make it more fun with this FREE sort the scene activity. – It is important to help kids increase their vocabulary. Using seasonal words is a fun way to make it relevant to your students. Download and print these FREE spring vocabulary cards to introduce or review themed vocabulary words. – Do you have readers in your home? Then they are sure to love these FREE reading logs to track all the books they read, bookmarks to mark their place and charts to monitor their rewards. Head over now to check them out and download a FREE Reading Tracker Pack too! – Writing prompts are a great way to help students improve their writing skills and stretch their creativity. Download and print these FREE Earth Day writing prompts to use in April. – April is National Poetry Month, which is the perfect time to introduce poetry or refresh your child’s memory about poetry. Be sure to check out all these FREE poetry printables that can be used throughout the month. – This printable springtime workbook is a fun way to introduce, review or improve math skills in your homeschoolers. With a fun spring twist, they will love working through these problems. – Math doesn’t have to be boring. It can actually be fun! These 10 ways are sure to make any kindergartner love learning their math facts. Don’t forget to download the FREE math printable too! – Are you working on learning place value this year in your math studies? Make it more fun and help it stick with this FREE Printable game! – Math Mammoth review workbooks provide students a thorough review of their particular grade level of math. This bundle includes math review workbooks for grades 1-7. But HURRY…this offer expires March 29, 2019. – Did you know you can teach and learn life skills while traveling together as a family? The “This or That?” Family Travel Planning Game will help you find the perfect scenario for your family to learn on location using the world as your textbook. – Singing in the Rain is one of the most beloved and well-known musicals. Have your children watch the movie-musical during a rainy spring day and complete this fun unit study for some added learning. – Whether you’re learning about Passover or studying the different feasts of the Bible, this FREE copywork is a fun way to help them remember what the Bible says about the Passover. – Using Bible studies in your homeschool is a great way to help your kids learn to read and study God’s Word. The Planting Seeds Bible Study is about the Parable of the Sower and a great way to add Bible to your homeschool routine. – Word searches are a fun way to introduce a new subject, add more depth to an existing study or just for some added fun in your homeschool. Download these Spring word searches for your kids to work through as you welcome the warmer weather and sunshine back. – International Mermaid Day is March 29th, so what better way to celebrate than with a few DIY projects and some FREE printables for the mermaid fans in your house! – Are you learning about sea turtles in your homeschool this year? Then you will want to add this FREE printable Sea Turtle study to your lessons. – If you’re learning about frogs or amphibians this year, you will want to grab these FREE anatomy of a frog notebooking pages to aid in your studies. – Can your kids identify different flowers? Now they can learn 20 different flowers by sight and name with this fun and FREE printable flower memory game. – Do your kids love crime stories, movies or television shows? Then they just might love learning all about forensic science and how it works. Check out these FREE forensic science courses and unit studies today. – Help your homeschoolers learn the 50 states, their capitals, regions, time zones, abbreviations and more with these FREE printable 50 states cheat sheets. It is a black and white printable to help you save on ink and can easily be used over and over. – This FREE notebooking journal allows students to research and learn about all 50 states and record what they’ve learned all in one spot. – This adorable Bugs preschool printable pack includes activities that will improve fine motor skills, muscle memory as well as hand-eye coordination through puzzles, pattern building, lacing cards, scissor practice, sequencing and more. – If your little one is working on learning, hearing and identifying beginning sounds, this fun and FREE printable picture sorting activity will help. All it takes is a little cutting and a place to sort. – What better way to bring a little spring inside for your preschooler than with these FREE printable alphabet flower mats. They can work on their fine motor skills while learning the shape and sounds of each letter. – Help kids work on their creative writing skills with this FREE draw and write template. Sometimes all they need is a little inspiration, which can come from their own drawing! – March is Women’s History month and the Who Was…? book series is a great way to introduce your kids to some women who made a difference in history. Plus, they can use this FREE bookmark to record what they learn about each woman as they read! – Learning to hear sounds is an important part of early learning and reading. Help your little ones learn to read and identify sounds with this missing letter stamping activity. – Do you require book reports from your homeschoolers? These FREE printable book report templates will help them learn the basics of what a book report entails. There are several different styles to choose from too. – If you love reading children’s books in your homeschool, then these FREE printables and activities are sure to be a hit with your readers too. Kids can read their favorite children’s books and then work through the corresponding printables and activities to make a complete study surrounding the book. – We love using emergent readers in our homeschool. They are a great way to help young and struggling readers gain confidence and practice their reading skills while learning about different topics. – Do your kids love the Marvel movie series? Now you can add some learning to their favorite movies with this FREE Marvel movie study. It includes a short bio of the creator, Stan Lee, with questions about him, two generic pages for use with any movie in the series. – Charlotte Mason encourages students to learn about art and artists. If you follow the Charlotte Mason homeschooling method, use these FREE printable art study worksheets while you learn about different works of art and the artists behind them. – If your kids love the Disney channel original movie, “Luck of the Irish,” they will love working their way through this FREE movie study. This is also a fun way to sneak in a little learning to your movie day. – This fun pack includes themed decoder message, word searches, a printable battleship game, and more all aimed at your middle schooler! This is a great pack to use on those rainy spring days. – Are you a Charlotte Mason homeschooler? Or do you want to learn more about this method? Check out this FREE Resource, Video and more to help you navigate the Charlotte Mason homeschool method most effectively. – Whether you celebrate the feasts or want to study them with your kids, this FREE Biblical Feasts Copywork is a great place to start learning about Purim. – During the month of March, you can work on learning and practicing Contentment with your children. Use the FREE Scripture copywork prompts to help teach your kids what the Bible says about it. 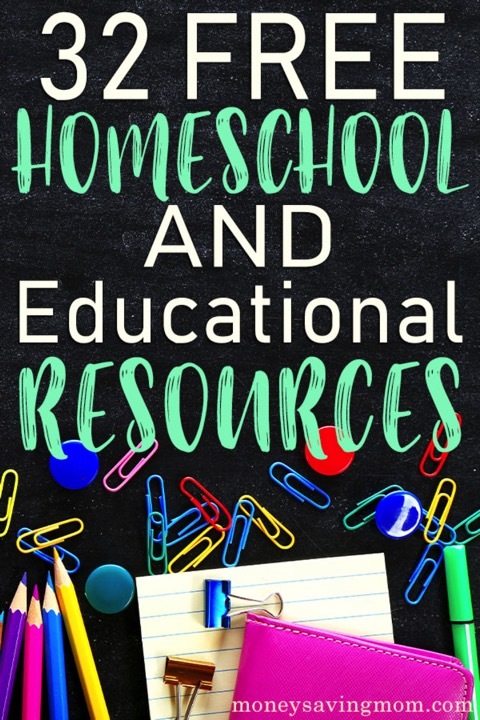 – This FREE guide is full of curriculum buying tips from a seasoned veteran, goal spreadsheets, encouragement, printables and unit studies for your children to use while you are pouring over this helpful guide! – Do your children know the order of the New Testament books of the Bible? If not, this FREE notebooking unit will help them learn and remember them, as well as the authors. – Kids can work on learning more about the weather, how it works and natural disasters with these FREE Weather Notebooking Pages. – Going outside and looking at the clouds can be fun for the kids. But can they tell you what they are? Use these FREE worksheets, printables and more to help them learn the names and properties of clouds. – Little ones love music, especially when you make it fun. If you’re looking for ways to bring more music to your preschooler, check out these FREE activities. – Helping children learn to express their feelings in a good way can be hard. Make it a little easier with this FREE preschool emotions printables perfect for St. Patrick’s Day. – Kids love the story, The Very Hungry Caterpillar. And with this FREE printable, they can learn the days of the week and recognizing different foods. – Do your little ones love doing “I Spy” books? Mine do! This FREE “I Spy” Fun Pack is a fun way to let them explore different objects that represent the holiday and test their counting skills too! – Little ones will have fun celebrating St. Patrick’s Day with these FREE printable playdough mats. This set includes four different letters and numbers 1-10. – Do you have a reluctant writer? These FREE silly sentences activities are a fun and easy way to help kids get over the stigma of writing being a boring thing. – Your kids will love exercising their imagination while using these St. Patrick’s Day themed writing prompts. This FREE printable pack includes 7 writing prompts on both lined and un-lined pages. – Kids can learn more about the man behind the holiday with these FREE printable copywork worksheets. – It can be hard for sixth graders to learn and remember everything about geometry. Give them a little help with these FREE printable posters for geometry and number sense. – Do your kids need help remembering their multiplication facts? Download these FREE printable games to help them not only learn them, but master and memorize them too! – If your kids are having trouble with their fractions and being able to put them in order, this FREE game can help! This is a fun way to help kids work on ordering fractions. – Help kids learn the difference between quadrilaterals and non-quadrilaterals with these fun and FREE printable shape cards and games! – History doesn’t have to be boring! If your girls love theAmerican Girl Dolls, they will love this unit study that highlights the life of Felicity growing up in Williamsburg in 1774. – This fun little craft is a great way to add a little Bible learning to your St. Patrick’s Day studies. – If your kids love the original Dumbo movie, they will have fun working through this FREE printable movie study too. Kids will answer discussion questions about the movie, read about elephants and more.